Guide Price of 400,000-425,000. 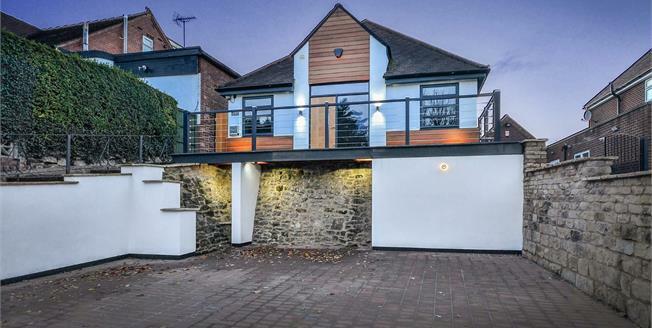 An individual detached house designed to meet modern day living. The accommodation of this sleek home comprises an entrance hallway with access to the ground floor accommodation. There are three very good sized bedrooms and the stunning four piece bathroom. The living accommodation benefits from a good sized kitchen-diner, equipped with integrated appliances, flowing through into the open-plan lounge-diner with bi-folding doors, opening onto the garden. To the first floor is a large space, perfect for a study and access to the master bedroom with beautiful en-suite bathroom. Outside of the property is a driveway to the front and an enclosed, private garden to the rear with unspoilt views. The property further benefits from gas central heating and uPVC double glazing. A grand, solid oak door gives access with stunning stair case to the first floor and doors to the ground floor accommodation. The kitchen comprises a range of wall and base mounted units with roll top work surfaces over. A central island with inset double sink, integrated washing machine and tumble dryer. Other integrated appliances include double oven, microwave, hob, extractor fan and dishwasher. There is a double glazed window to the side, radiator and large opening into the lounge-diner. This stunning space has bi-folding doors opening onto the garden - bringing the outside in, giving a true feel of open plan living. With further windows to either side and radiators. Double glazed window facing the side, radiator and sliding door wardrobes. Double glazed window facing the front, radiator and fitted wardrobes. WOW! The four piece suite comprises a low level WC, wash hand basin inset in vanity unit, walk in rainfall shower and a inset bath. The bathroom benefits natural lighting from the Velux window and also has a heated towel rail. Located at the top of the solid oak staircase is the perfect office space - with Velux window and radiator. The master suite boasts two large Velux windows with unspoilt views of the countryside and access to the impressive en-suite bathroom. Pure luxury - the three piece suite comprises a large, free standing bath, low level WC and a wash hand basin inset with vanity unit. There is a Velux window to the side and a heated towel rail.